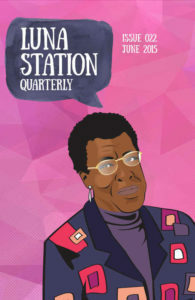 Year six of Luna Station Quarterly continues! Once again, the stories gathered here for your enjoyment represent a myriad of voices from women around the globe. This issue has androids, magic carpets, virtual reality, and quite possibly the most original usage of origami cranes you’ve ever seen. So go on…buy this issue already!